Oli Hawkins toasted Pompey’s fifth successive League One win after seeing off Rochdale and beamed: The buzz is back. Now the Blues front man hopes the fine recent form can be continued in order for automatic promotion to the Championship to be achieved. Kenny Jackett’s troops eased to a 4-1 win over relegation-threatened Dale to maintain their momentum in the race for a top-two finish. 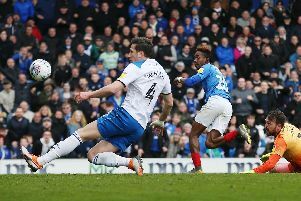 That moved fourth-placed Pompey level on points with Sunderland, in third, after they lost to Coventry with five fixtures to play. It also leaves the Blues two points off Barnsley in the automatic promotion places and they have a game in hand on Daniel Stendel’s men. And Hawkins revealed the atmosphere within the squad is similar to the first half of the season ahead of the final run-in. Pompey enjoyed a blistering start to the season, which saw them five points clear at the summit back in January. However, a run of seven league matches without a win before beating Bradford last month threatened to scupper the Blues’ hopes of reaching the Championship automatically. Yet Jackett’s men have taken 15 points from a possible 15 following the win over Rochdale. And Hawkins insisted the belief and buzz around the squad is sky high as they look to secure a top-two finish. He said: ‘Obviously we had a really good first half of the season. ‘But I feel the atmosphere and the buzz around the training ground is similar to earlier in the season. ‘It’s shown in these past five games, obviously being unbeaten. Automatic promotion is now in Pompey’s hands with five games to play following Sunderland’s defeat to Coventry. And Hawkins sees no reason why the Blues cannot claim maximum points in their remaining matches to reach the Championship. He added: ‘We’ve got to keep battling in these last five games and every player has got to step up.